Crunchy, stringless self blanching sticks. T&M’s easy starter plants are expertly grown, taking away all of the worry of raising your own. Delivered ready for planting so that you can enjoy bigger, earlier and tastier vegetables. Our quality vegetable plants will be despatched at the correct time for planting. Please note: Delivery is subject to plant size, adverse growing conditions during production may delay despatch schedules. An autumn/early winter vegetable. Celeriac Monarch is an excellent, high quality variety which has very smooth, easily washable, creamy coloured roots. 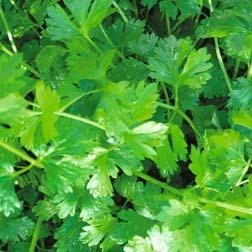 Easier to grow than celery and can be grated raw over salads, cut into slices and boiled, or into strips which are fried. T&M’s illustration shows Celeriac cubed and served with a walnut butter. An exciting dish which you too can create by using the FREE recipe, sent with each packet. Plants produce strong upright stalks that taste crisp, clean and succulent. Bolt-resistant holding quality a long time. 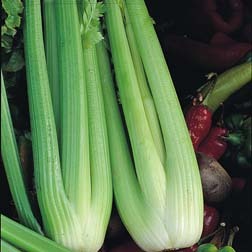 The lightly ribbed stalks of Celery Victoria maintain an appealing vitamin-rich apple-green colour, changing to white at the base. Grows where traditionally difficult. (Apium graveolens). 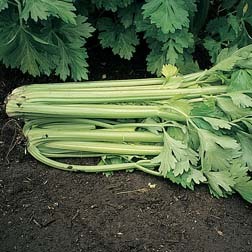 Immature celery plants produce a clump of delicious, slender stems and leaves for cutting. Cutting Celery should be cut regularly to promote fresh growth, for use in summer salads and garnishes, or in soups and stews during the winter. Height: 20cm (8 inches). 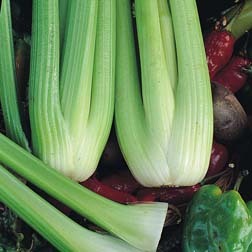 A heavy yielding variety with long stringless sticks of crisp tasty celery. 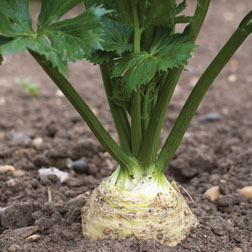 Celery Lathom Self Blanching is reasonably free from bolting it can be sown earlier than other varieties and is also useful for growing in plastic tunnels as well as outdoors. A self-blanching variety with beautiful apple-green, smooth stems with good flavour and texture for that all important celery crunch. 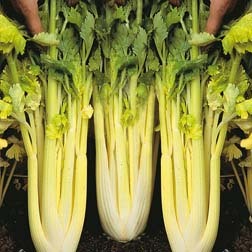 Celery Tango has good bolting resistance and stands well during hot weather for reliable crops. 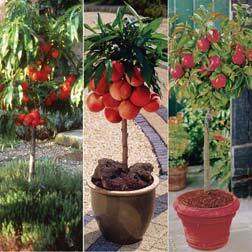 Everyone should be planting at least once fruit tree in their garden or in a tub on their patio. By planting a tree you’ll provide yourself with free fruit for years to come. Trees need a little attention with some pruning once a year but that’s it! An entire orchard on just one tree! Family fruit trees have three different varieties grafted onto one stem, which will pollinate each other and crop at different times to extend the picking season. Perfect for the smaller garden with room for only one tree; and even suited to growing in a large patio container (holding at least 30 litres of compost). Apple rootstock: M106. Pear rootstock: Quince A. Height and spread if not containerised: 4m (13’). Collection comprises 1 family apple tree and 1 family pear. Harvest from September. 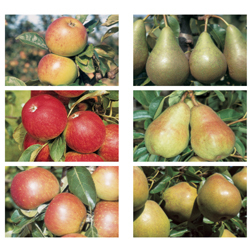 Family apple tree varieties: Apple ‘James Grieve’, Apple ‘Discovery’, Apple ‘Sunset’, Pear ‘Conference’, Pear ‘Williams Bon Chretien’ and Pear ‘Doyenne du Comice’. Imagine an orchard on your own patio! These fruit trees have been specifically for their dwarf habit making them ideal for growing in large containers on the patio.Collection comprises: Apple ‘Red Falstaff’ – Produces heavy crops of crunchy, juicy, red skinned apples with good resistance to scab. Height: 1.8m (5’,9″). Spread: 1.5m (4’,9″). Rootstock: M27. Nectarine ‘Necterella’ – Bred in California, Nectarine ‘Necterella’ is a genetically dwarf variety, making it ideal for growing in containers. Height and spread: 1.5m (5’) Rootstock: St. Julien.M, Peach ‘Bonanza’ – Each spring the trees are covered in a mass of pink blossom, followed by delicious full sized fruits. Height and spread: 1m (3’) Rootstock: St. Julien. Plums are delicious eaten fresh, or made into a plum crumble or jam. As supermarkets are reluctant to offer the best tasting varieties due to thin skins and bruising, growing your own is the best way to enjoy the real flavour that this fruit can offer. 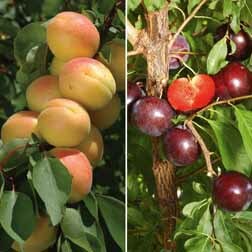 Plum ‘Full Season Collection’ are grafted onto a semi-dwarfing rootstock, to produce compact, productive trees. Although these varieties are all partially self fertile, when planted together they will aid pollination and increase yields between each other for an extended cropping period from July to September. Height and spread: 3.5m (11’). Rootstock: St. Julien A. Collection comprises 1 tree each of: Plum ‘Opal’, Plum ‘Victoria’ and Plum ‘Seneca’. Collection includes: Aprium Cot ‘n’ Candy – This Amazing variety – it’s 2/3 apricot and 1/3 plum! The crunchy fruits, which look more like apricots than plums, have a lovely sweet flavour. Partially self fertile, it is best grown alongside an apricot for improved pollination and will then produce large, superb-tasting crops in early August. Pluot Purple Candy – The perfect partner to Aprium Cot ‘n’ Candy, this cross is 2/3 plum and 1/3 apricot! With the fragrant taste of an apricot and the juicyness of a plum, fruits are as large as a peach and deliciously flavoursome. 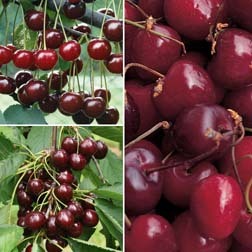 A collection of delicious dessert and cooking cherries that can be harvested from mid July. Cherries make attractive trees both in flower or when laden with fruit. Grafted onto a dwarfing rootstock, to produce compact, productive cherry trees with good sized fruits. These cherry trees are well suited to growing in small spaces and 60cm (2’) diameter containers, or trained against a wall. The trees in this collection are all self-fertile and therefore do not require pollination companions close by. Height and spread: 2.5m (8’) Rootstock: Gisella 5/6. Collection comprises 1 tree each of: Cherry ‘Stella’, Cherry ‘Sunburst’ and Cherry ‘Crown Morello’. NEW & EXCLUSIVE – Be one of the first to buy this new and exclusive rose lily. ‘China Girl’ produces top class lilies at a fraction of the price you pay at the florist – that’s if you can find them. They’re pollen free, so there’s less risk of allergy – and they won’t stain your clothes. Plus, the best bit is that they have a more gentle fragrance, so even lily-haters will love them. It’s difficult to believe these lilies are real – they’re just like porcelain. Top-class lilies at a fraction of the price you pay at the florist, that’s if you can find them. And the best bit is that they have a more gentle fragrance, so even lily-haters will love them. They’re pollen-free too, so there’s less risk of allergy – and they won’t stain your clothes. Mulch is the answer, now what’s the question? Mulch can solve lots of gardening issues. Mulch can make your garden look tidier, smarter, keep down weeds, reduce the need for watering in a dry summer (remember those?) and supplement the soil. It’ll encourage worm activity which makes for a better soil. Hallstone Bark Mulch is a mid-dark brown general purpose landscaping bark derived from an FSC certified source. It is a natural product which can enhance the appearance of your garden, inhibit weed development, improve moisture retention and act as insulation for plant roots, reducing plant loss in cold weather. Hallstone Blue Slate is a contemporary, distinctive landscaping chipping which is suitable for many uses including paths, driveways, ponds and as a decorative mulch to inhibit weeds and aide moisture retention. Fish friendly. Pack of 10 60L bags Rolawn Landscaping Bark. A quality multi-purpose grade bark mulch derived from forestry woodchip, to enhance your garden, inhibit weeds and retain moisture. Hallstone Plum Slate is a contemporary, distinctive landscaping chipping which is suitable for many uses including paths, driveways, ponds and as a decorative mulch to inhibit weeds and aide moisture retention. Fish friendly. A quality, peat free mulch, manufactured from stabilized chopped straw, that promotes healthy plant growth by enhancing soil fertility and retaining water effectively. Ideal for use as a mulch or soil improver in any bed or border. Pack of 16 60L bags Rolawn Landscaping Bark. A quality multi-purpose grade bark mulch derived from forestry woodchip, to enhance your garden, inhibit weeds and retain moisture. Rolawn Play Grade Bark is a quality, reddish brown, decorative, ornamental pine bark; which is ideal for use in children’s play areas. It is tested to BSEN1177:1998 regarding impact absorption. Rolawn bark mulch will inhibit weed development, improve moisture retention and act as insulation for plant roots, reducing plant loss in cold weather. Pack of 24 60L bags Rolawn Landscaping Bark. A quality multi-purpose grade bark mulch derived from forestry woodchip, to enhance your garden, inhibit weeds and retain moisture. Pack of 48 60L bags Rolawn Landscaping Bark. A quality multi-purpose grade bark mulch derived from forestry woodchip, to enhance your garden, inhibit weeds and retain moisture. Doesn’t the soil on this allotment plot look amazing? The blog is packed with lovely pictures! Garden Answers is written by real gardeners, providing solutions to an audience who are truly passionate about their garden. Garden answers is not only the most practical gardening magazine available, it aims to inspire, encourage and help you to garden. 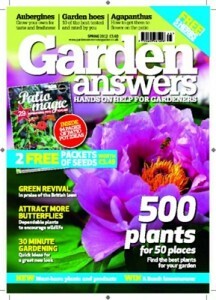 Please note: Garden Answers is published 13 times a year. A bi-annual direct debit splits the annual cost into two equal amounts – so in each half you will receive a minimum of 6 issues, but 13 issues in a full year. Direct Debit: You enter into a Direct Debit agreement with the intention that your subscription will continue for a minimum period of 12 months, even if the frequency of payment is for a shorter period. However, you will still have the right to cancel your Direct Debit in accordance with Direct Debit Guarantee below if you so desire. If you do cancel, you will receive only the issues you have already paid for. If a gift is included as part of the subscription offer we reserve the right to request the return of the gift in the event of an early cancellation of the subscription. what boots do I wear on my allotment? I’ve got a pair of these. I’ve had them over a year and half now and they’re still in very good condition. They’re waterproof, warm and easy to put on and take off. The bottom part is made of tough material that keeps the rain and mud out. The sole has plenty of texture too so you grip, and they adjust easily to do up over any size of socks. They are lovely to wear and I will be replacing them when they wear out in a couple of years with another pair. When it’s too wet for these then it’s too wet to dig! They are as waterproof as wellies for general use – so unless you’re planning on wading in deep water then they’ll be fine. They are good for keeping your feet warm and they are lined with fleece which makes them a real delight to put on. The velcro straps might not make these the most fashionable boots out there but I know even when my hands are stiff and cold after being outside for a couple of hours in winter, I can easily undo them. They also come up slightly higher than other gardening shoes or boots which means they keep your ankles warmer too! Good value, long lasting, comfortable boots for gardening and allotmenting in.